When Encorp Strand, in Kota Damansara, Petaling Jaya was completed in late 2007, there may have been some concern about who will be occupying these 265 units of shops and office space. Today, most of the ground floor units are tenanted. The story of Encorp Strand, with a gross development value of RM1.34bil by Encorp Bhd is pretty much linked to Dataran Sunway, another commercial development located adjacent to it across the road by the Sunway group. Dataran Sunway, of about the same size as Encorp Strand, was the first to take off. Because it was the first to market, it was popular with investors and tenants. Investors, seeing the popularity and vibrancy it generated, bought into Encorp Strand when it was put on the market. With tenancy picking up and prices doubling in the secondary market, Encorp executive chairman Senator Datuk Seri Mohd Effendi Norwawi is encouraged with the work they have put in to create yet another hub. The gross development profit (GDP) from the project is expected to be about RM300 mil. This comprises the GDP from the 265 units Shop Offices (less the 29 units retained by the company), the Garden Office and the serviced residence component. The GDP excludes developments that will be retained by the group, namely the mall and its elevated car parks, the Boulevard, the 29 shop offices and the Garden Office car parks. Besides Encorp Strand in Kota Damansara, the company also has projects in Penang, Shah Alam and Puteri Harbour in Iskandar Malaysia, Johor. Its three core businesses are property development (an on-going project with a gross development value of RM2.1bil), construction management (with an order book of 1.8bil) and government concession (housing project valued at RM2.2bil). On the on-going changes at Encorp Strand, Effendi says his three-storey shop units were RM1.08mil in 2005. Today, some of them are priced at more than RM2.2mil in the secondary market while the four-storey units with lift are priced at RM3.2mil. It was previously RM1.8mil. An agent who declined to be named said the capital value is growing faster than the rental. Last week, they launched their second component, the Garden Office comprising 258 units of office suites on 2.6ha. It is currently 60% sold. This project comprises 14 blocks of six and seven storeys with built-up ranges from 1,705sq ft and 2,510sq ft. It was sold at an average price of RM700 per sq ft. The Garden Office is not designed as a single block, but a total of 14 blocks located in clusters around a stretch of landscaped area in the centre. The second thing going for it is that it is low rise, comprising six to seven storey blocks. The third element is its use of open space with a rooftop garden for some of the blocks. On paper, the concept is aesthetically pleasing. Whether Effendi will be able to pull it off is another matter because rooftop gardens are not easy to maintain and there are several here. The other interesting feature about Garden Office is that it will be connected to a larger and more comprehensive commercial development comprising its already completed shop and office suites via a walkway. The Garden Office is expected to be completed in 2013 with a gross development value of RM320mil. He could be right. Despite it being leasehold, Kota Damansara has become home to many. It is the 400,000 households within a 5km radius that Effendi hopes to draw to Encorp Strand. He is offering different components to attract the crowd. Besides the Garden Office, he is also planning to build a neighbourhood mall and on top of it will sit a 40-storey serviced apartment. About 60% of the 280 units will be studio units of about 650 sq ft, 30% 2-bedroom units of about 1,000 sq ft. He is targetting the young executives. To be launched next year, the studio units will be selling at about RM360,000. “We have been getting quite a bit of enquiries for the serviced apartments,” he says. Effendi has roped in the services of French architect Nicolas Ayoub to give the entire 18ha that make up Encorp Strand a bit of ooomph! In some aspects, it will be a more pleasant place than its competitor across the road. For one, the roads are wider. For another, there is more open space. Effendi promises his project will be of a superior product. “Together with the office space, shop lots, Encorp Strand will be an integrated development comprising five components. Work on the mall and boulevard started last year and is expected to be completed in 2012. “We are creating a community in this 45 acres. The mall will have several anchor tenants - a cinema, a bowling alley, possibly a performing arts theater, a fitness centre and all the basic amenities that make up a township in this single location,” he says. With The Curve a 10-minute drive away, and the newly opened Giza Mall in Dataran Sunway, and the Giant Hypermarket next to Encrop Strand and the Sun Suria Industrial Park, Effendi does not think there is any over supply of commercial and retail area. “Encorp Strand will be very self-contained. It will be different from Dataran Sunway and the 40-storey block will be among the highest in this part of Petaling Jaya,” he said. He has promised more than 3,000 car parks. With the way things are moving in Kota Damansara, whether that will sufficient is difficult to say. That place seems to attract people like bees to honey. What is missing is public transport which is currently in the pipeline. Mah Sing Group Bhd, the country's fifth largest property developer by revenue, expects overseas projects to contribute 30 per cent of total sales by 2015, group managing director Tan Sri Leong Hoy Kum said. Currently, there is no contribution from overseas. Mah Sing has a cash pile of RM233 million and plans to capitalise on opportunities in China, Singapore, Australia, Indonesia and Vietnam. It will launch its maiden project early next year in Jiangsu province, China, with an investment cost of US$620 million (RM2 billion). Mah Sing has a 51 per cent stake in the project, which is expected to contribute to its sales from next year. "We want to replicate what we have been doing here and further enhance our image and branding to be one of the premier lifestyle regional developers. We want to grow big and satisfy our shareholders," Leong told reporters yesterday after the company's shareholder meeting in Kuala Lumpur. Mah Sing's strong institutional shareholders, who collectively own 56 per cent of the company, include Permodalan Nasional Bhd, the Employees Provident Fund and Koperasi Permodalan Felda Bhd. Mah Sing has 21 projects worth RM6.3 billion in the Klang Valley, Penang and Johor. The company has set a sales target of RM1 billion this year. In the first three months, it raked in sales of RM601 million. 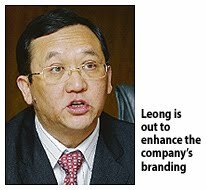 Leong said that Mah Sing was confident of exceeding its 2010 target with contributions from its new projects and unbilled sales of RM1.1 billion. Among the projects to be launched in the second half of the year are the Icon Residence @ Mont'Kiara, M Suites @ Jalan Ampang, One Legenda in Cheras, Garden Residence and Garden Plaza in Cyberjaya, and Austin Suites in Johor Baru. Mah Sing is also scouting for niche, quick-turnaround landbank in Kuala Lumpur, Penang and Johor and an area of more than 80ha in Selangor, Leong said. "When we buy land, we want to launch immediately and lock in sales to pare down debts. Property business is a financial game. You have to manage your cash flow. "We are not highly geared now. With good concept, branding and track record, we are able to sell well all our products. We are confident our niche products will attract locals and foreigners," he said. Leong added that Mah Sing was keen to develop the prized government land in Sg Besi and Sg Buloh and had expressed its interest to the government. It also wants to lend a hand in the proposed international financial hub in Kuala Lumpur. KUALA LUMPUR: Mah Sing Group Bhd’s low gearing ratio of 0.05 times as at March 31 has provided the group with the capacity to gear up further, said group managing director and group chief executive Tan Sri Leong Hoy Kum. At a briefing yesterday, he said that should the company gear up to 0.5 times, there would be about RM400mil available for landbank acquisition. However, he added that the group was not in a hurry to raise its borrowings as it was in cash flow positive position. Leong said the group had so far acquired three parcels of land with a gross development value (GDV) of RM712mil and was still on the lookout for more land. “We are constantly scouting for more landbank. We’re looking at land aggressively everyday,” he said. As at March 31, Mah Sing has cash and cash equivalents of RM166.9mil. For the year ended Dec 31, 2009, the group had cash and cash equivalents of RM356.6mil. Executive director for corporate and investment Steven Ng Poh Seng said the company spent some of its cash in the first quarter to purchase three parcels of land, resulting in the lower cash hoard. However, he said Mah Sing’s cash and cash equivalents had improved to RM233mil in May. Leong said should the group decide to raise its gearing up to a 0.5 times, it would be a non issue as it was still “very comfortable”. Meanwhile, he said the group was confident of achieving its RM1bil sales target for this year as it had achieved sales of RM601mil in the first quarter. For the three months ended March 31, Mah Sing posted a net profit of RM27.8mil on revenue of RM238.8mil, driven by its residential and commercial projects. Leong said Mah Sing had a strong earnings sustainability from the combined RM6.3bil in remaining gross development value (GDV) and unbilled sales. Its unbilled sales stood at of RM1.1bil. “Mah Sing is cautiously optimistic that 2010 will be a good year for the Malaysian property market and backed by a good employment market, strong liquidity and still-conducive interest rate levels,” he said. The group is also interested to participate in government tenders for land in Sungai Besi and Sungai Buloh to be developed by the private sector.On overseas expansion, Leong said Mah Sing was looking to venture into Vietnam, Singapore, Indonesia and Australia. Leong said the group had signed a letter of intent on a joint venture basis with 51% stake to develop a mixed development project in Wujin District, Changzhou, China. He expects overseas projects to contribue 30% to group revenue in the next five years. BUILDING Kuala Lumpur into a world-class liveable city will need clear, cohesive and holistic efforts and plans by all stakeholders and the authorities involved. It is a huge exercise where all issues and challenges should be duly looked into and addressed. Kuala Lumpur has the potential to join the league of other leading global cities if all the relevant stakeholders put on their thinking caps and get their act together. Doing an honest audit on what are its strengths and weaknesses will be a good start to find out where it stands compared with other cities around the globe. We can expect a long “to do” list that has to be executed cohesively to get the desired results. A holistic master plan with the necessary strategies and plans can then be drawn up and it should leverage on the city’s key strengths and steps taken to address its weaknesses. Among some of the key assets that Kuala Lumpur command are its friendly and culturally diverse people and their way of life, a wide array of culinary cuisine offerings and relatively lower cost of living. For the shopaholics, it is also a shopping haven with nice shopping malls featuring world renowned brands and wide array of merchandise. Instead of just focusing on the hardware side of things and jumping into more physical projects to trump up its global city status, due attention must also be given to its software. While Kuala Lumpur can trumpet about having good infrastructure hardware such as one of the world’s best airports and buildings, the software that include the values and integrity of the people and the government, corporate governance and transparency standards, and consistency in government policies also need sprucing up. Government policies should be long-term and consistent at all levels, especially at both the federal and state levels, as inconsistent and flip flop policies have long been frowned upon and are still bones of contention for foreign investors. Other important “software” issues that need immediate attention include the level of security and safety in the city, the people’s general well being and their quality of life. If we look around housing estates today, whether in Kuala Lumpur or the Klang Valley, the once “open and carefree” neighbourhoods have been replaced by fenced up and barricaded estates that are guarded around the clock. This shows a general sense of insecurity and haplessness among the people. Shoring up the safety and security index in in the country has been made one of the National Key Results Areas under the Government’s national priority areas of focus for a national transformation. It is now time to turn it into reality rather than just a target. Another key area of focus is to put in place an efficient, reliable and well integrated public transport system for Kuala Lumpur and the other satellite towns. Having the ability to move easily and comfortably around our cities will save resources and boost productivity for the country as less time is wasted on the roads when there is less congestion and traffic jams. It will also attract more high net worth visitors and investors to the country. The Government’s initiative to build a mass rapid transit system is a much awaited project that will certainly raise the liveability bar for Kuala Lumpur. Most global cities are also renowned for their other software such as their rich culture and performing arts, well maintained parks and green lungs, and facilities for other wholesome leisure activities. To alleviate the congestion in the city area, it will be appropriate for the authorities to restrict high density developments in already overcrowded areas, and be proactive in providing more public areas and parks for recreation and leisure activities. For a better liveable environment, projects should be rated according to their scale of sustainability and how they can add value to the people and the environment. Deputy news editor Angie Ng believes the challenge for Kuala Lumpur is to ensure the city’s old and new co-exist and blend seamlessly with each other. It may be an old issue but public transport is hogging the limelight again. 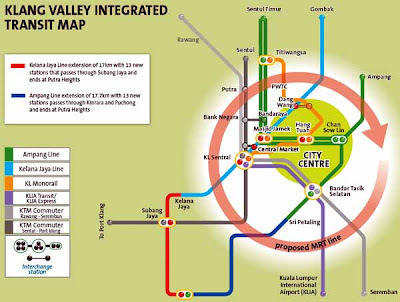 A new regulator has been tasked with the ambitious plan of drawing up a well-researched masterplan for public transport in the Klang Valley and the rest of the country. At the same time, two well-known construction companies have taken the initiative to draw up a plan for a much-awaited mass transit system (MRT), which no one disputes will propel the state of public transport in the Klang Valley to new heights, if executed well. The public are excited that for once in their lives, there could be real connectivity from home to work. But there are also concerns if such a mega project will be well planned and whether it will be too much of a strain on the Government’s resources. Moaz Yusuf Ahmad, who runs The Association For The Improvement Of Mass Transit (Transit), a consumer association championing better public transport, says existing systems need to be made better first. “Before we can build more light rail transit (LRT) or MRT lines, we have to solve the existing problems in the industry, such as public transport workers’ salaries and benefits, flouting of rules, dismal safety record, and above all, the ineffective and costly ‘entrepreneurial’ model for public transport, which has done little for the industry beyond enriching permit owners,” he says. To be sure, there are already plans afoot to enhance the existing public transport systems. The recently-formed Land Public Transport Commission or SPAD has been tasked with carrying out the initiatives for the National Key Result Area (NKRA) for urban public transport under the Government Transformation Programme. These include re-routing buses through less congested highways and even having more specialised lanes for buses. There are also plans to increase the number of trains on the existing LRT and KTM Bhd Komuter and the monorail. In addition, there are two major extensions planned for the LRT. However, there is a view that buses and the existing rail infrastructure alone will not cater to the growing needs of public transport in the Klang Valley. 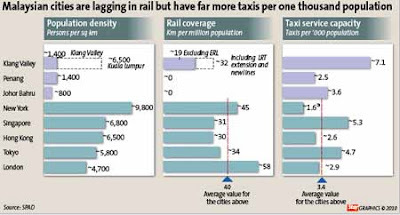 Data compiled by SPAD indicates that Klang Valley’s rail coverage still lags behind most major cities in the world, in terms of km per million population. Even if the LRT extentions are included, the Klang Valley’s rail km per million population would stand at 32 versus an average of 34 for the cities of London, New York, Singapore, Hong Kong and Tokyo. But data extracted from the recent proposal by Gamuda Bhd and MMC Corp Bhd for an MRT project in the Klang Valley shows that the gap is much wider, with Kuala Lumpur’s rail network being only 15km per one million population versus most other cities with over 40km per one million people. No wonder then that the 10th Malaysia Plan (10MP) specifically mentions that the public would get to enjoy an MRT system 156km long and covering a 20km radius around the Kuala Lumpur city centre, carrying two million passenger trips per day when completed. The 10MP does not, however, state the deadline for constructing the MRT system to overcome traffic congestion and transform the “Livability of Greater Kuala Lumpur” into a global city. Another key aspect of the Gamuda-MMC proposal is that it stands to unlock land values, especially so as it connects major planned property development projects. These include major land privatisation projects in the Klang Valley. The planned MRT route reaches the Matrade redevelopment area by the Naza Group, the proposed Sungai Besi redevelopment and the planned Kuala Lumpur International Financial District on 85 acres popularly known as Dataran Perdana. “It is a no-brainer. The MRT will bring about a positive impact on values of real estate located within walking distance of the MRT stations,” says property consultant and map-maker Ho Chin Soon. On the flipside, there is the concern of over-development and a property glut. “What you don’t want to see is all this massive investment goes into creating new pockets of development with MRT stations nicely built up to access these places, but they end up not being used due to a possible glut of such properties,” cautions Elvin Fernandez, managing director of property valuer and consultancy firm Khong & Jaafar Sdn Bhd. Who’s going to pay for MRT? Another major issue with regard to the planned MRT will be funding. 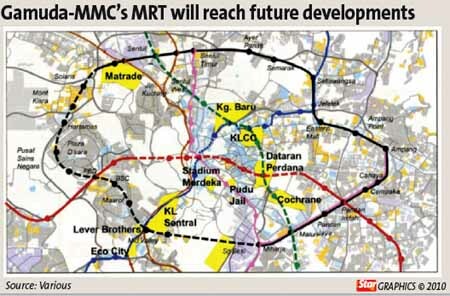 Reports have indicated that the Gamuda-MMC MRT project could cost RM36bil. If land acquisition, rolling stock and the redevelopment of underground commercial space are included, the figure could top RM43bil. The question is, who will fund this? Thus far, the 10MP has been silent on how the MRT will be funded. The Gamuda-MMC proposal, based on those familiar with it, assumes that the Government will foot the bill on the basis that the economic returns from the project are very high. To be noted is that public funding for MRTs is typically absorbed by the government, like in Singapore and London. It is also worth noting that the two LRT operators had to transfer the rail lines to the government-owned Syarikat Prasarana Negara Bhd in 2002, while the monorail was transferred in 2007. The operators had found themselves in financial distress after failing to make sufficient returns on the operations to finance debts incurred during the construction as well as other operational requirements. Still, aside from the economic benefits, there are other multiplier effects that a project like the MRT will bring about. Construction and building materials will benefit, and jobs will be created for engineers, designers, architects and the likes. Hence it is understood that some quarters are expecting the Government to fund the MRT from the savings from reducing fuel subsidies. But that may not be so easy, points out Yeonzon Yeow, head of research at Kenanga Investment Bank. “The idea that the Government will finance it (MRT) with savings from eliminating fuel subsidies is theoretical at best. Remember that fuel subsidies affect everyone in the country. There would be questions if you used that savings just to enhance the transport system in the Klang Valley,” Yeow says. He adds that if the funding is raised though bonds guaranteed by the Government, it (the Government) may ultimately have to bear the burden if the project is not able to cough up sufficient cash flows from ticket sales. “Will that fit in with the Government’s austerity drive to bring the budget deficit to below 2.8% by 2015,” he asks. The only mega rail-based private-sector driven public transport system that had not needed a major bailout is the Express Rail Link Sdn Bhd (ERL), which operates the KLIA Ekspres and and KLIA Transit train services. Its executive chairman, Datuk Mohd Nadzmi Mohd Salleh, who is also a major player in the public bus sector through his Konsortium Transnational Bhd (KTB), agrees that the MRT is a step in the right direction but that careful planning will be key. “The structure of public transport should be better planned so that there should not be any more bailouts like in the past. Instead of spending a large sum of money on mega projects, the government should have short-term, medium-term and longer-term plans, to alleviate the congestion in the city,” he says. At the same time, he adds, private sector involvement in the running of public transport is important. “The private players are actually best suited to bring about the necessary efficiencies and new revenue streams like exploiting advertising opportunities on the vehicles. He says the Government cannot afford to go on subsidising public transport. “It has to be efficiently run and at the same time, it has to be attractively priced. It can be well planned so that it can get sufficient numbers using it and then the returns from ticket sales can go a long way into subsidising both the operational and capital expenditure of the new systems,” he argues. He cautions though that before the MRT is agreed upon, more detailed study of the needs of public transport should be done. “The methodology of public transport planning should be given a lot of thought and effort. At the moment, we don’t have this data. We don’t know where the real needs of public transport are,” he says. Will SPAD get it right? And that’s where SPAD comes in. Its officials have said they will study the MRT proposals (the one from Gamuda-MMC and any other ones that goes to the Government) and incorporate all of that if possible into its own public transport masterplan for the Klang Valley. SPAD in fact is being tasked with revamping the entire public transport system. Besides the Klang Valley masterplan, which will be due in six months time at the earliest, SPAD will also be given the mandate to take over all licence issuing authorities, reorganise the bus network in the Klang Valley, integrate smart ticketing and monitor the overall standard performance of all public transport services, to name a few. SPAD chairman Tan Sri Syed Hamid Albar told a news conference on Thursday that it aimed to more than double travel on public transport to 25% by end-2012 from 12% currently. “Yes, it is ambitious, but achievable. This is the first time we have a specific body to deal with the various land public transport issues,” he added. But it is going to be an uphill task. Policy setting, operations, regulation and enforcement of public transport has been spread throughout a multitude of Government departments, agencies, including state bodies. SPAD has to not only communicate and extract data and expertise from these bodies, it also plans to usurp most of their powers. “This is going to be SPAD’s single biggest challenge, especially when it comes to the issuance of lucrative licences. Will SPAD be able to reorganise that?” questions a government official who declines to be quoted. On a positive note, SPAD has been placed under the Prime Minister’s Office and that should give it the necessary clout to do its job well. Developments at the Senai International Airport in Johor are expected to accelerate following the set-up of the Aero Mall, a stand-alone and external airport mall. "There are now RM2.5 billion worth of ongoing projects at the airport area," Senai Airport Terminal Services Sdn Bhd (SATS) chief executive officer Datuk Mohd Sidik Shaik Osman told Business Times in an interview. They include the RM2 billion Senai High Tech Park and the Free Zone Logistics and Aerospace Industrial Park. 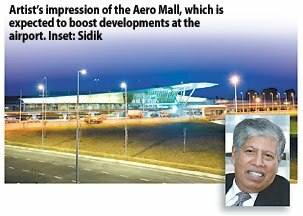 Sidik said the Aero Mall, which will open on July 1, will set a new wave of development for SATS, which has 1,120ha surrounding the Senai airport. The RM80 million, 173,338 sq ft mall is an integrated lifestyle complex adjoining the airport. It has 29 retail outlets and 30,000 sq ft piazza area. Some 70 per cent of the lots have been taken up for shopping, entertainment and dining facilities. Sidik said that there are also plans for a cineplex and a digital complex. "When we took over the airport in 2003, it was just a building to service passengers flying to Kuala Lumpur. We have expanded service to include flights to Penang, Kota Kinabalu and Kuching, and other facilities. "Malaysia Airlines and AirAsia operate some 220 flights a week (out of the airport) and we hope that will be increased as we work to grow air traffic and passenger volume," Sidik said. "Passenger traffic at the airport is now more than two million, including meeters and greeters. We expect this to double in the next three years." Sidik expects new developments in Iskandar Malaysia in the state to contribute to the airport's growth. Ongoing projects at Iskandar Malaysia include Legoland, premium factory outlets, universities and hospitals, targeted to be ready by 2012. "Iskandar is expecting some four million visitors a year. We think this will increase air traffic and passenger volume. The airport can handle up to 4.5 million passengers a year before it requires any expansion." On the Senai High Tech Park and the Free Zone Logistics, Sidik said that SATS might undertake a fund-raising exercise, in the form of internal funds and loans, to get the projects moving. He is ambitious about both projects and is confident that they will attract investors. The high-tech park has drawn interest from investors in the US, Europe and China who are in various sectors, including semiconductor and solar energy. There are confirmed investments from China's EQ Solar Technology International Sdn Bhd, which will invest US$500 million (RM1.6 billion) to produce solar modules, and leading industrial gas provider MOX-Linde Gases Sdn Bhd, which plans to set up an industrial gas separation plant. "We have incentives to attract investors. Those who come into the Iskandar region will enjoy low income tax, among other things," Sidik said. Still, SATS may face stiff competion from Singapore, the KL International Airport and the Port Klang Free Zone, which are also aggressively attracting investors through various incentives. PETALING JAYA: Sunway Real Estate Investment Trust (Sunway REIT) initial public offering of 1.52bil units was well received and the order book was fully covered despite a cautious sentiment and volatility in the equity markets. In a statement yesterday, Sunway REIT Management Bhd (the manager) said the deal, which was signed yesterday, was set to raise RM1.49bil, mainly from key domestic as well as international institutional and high networth investors. It said the institutional offering was priced at 90sen per offer unit and the retail offering was priced at 88sen per offer unit. The implied market capitalisation of Sunway REIT upon listing, based on the institutional price and 2.68bil issued units, would be approximately RM2.41bil, positioning Sunway REIT as the largest Bursa Malaysia-listed REIT. It added that upon listing, Sunway REIT property portfolio would include eight of Sunway City Bhd’s existing prime properties situated in Penang, Perak, Selangor and Kuala Lumpur.